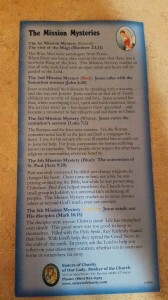 What Are the World Mission Mysteries of the Rosary and Should We Pray Them? 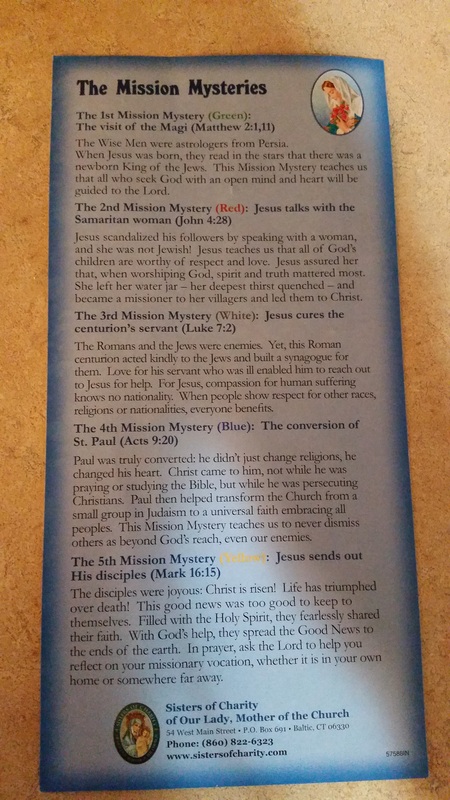 Some time ago, I received a “World Mission Rosary” in the mail from the Rosary Shrine of St. Jude, along with a pamphlet describing a new set of mysteries, the “Mission Mysteries.” Being an avid promoter of the Rosary, these mysteries piqued my interest. I thought about writing up an article then, but decided against it, as I hadn’t seen anything else talking about these mysteries and put the idea on the back burner. But a couple of weeks ago, I received a second World Mission Rosary in the mail from a different religious order, the Sisters of Charity of Our Lady, Mother of the Church. 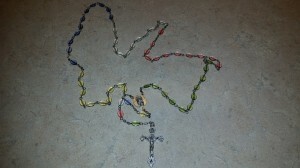 What is the Mission Rosary? 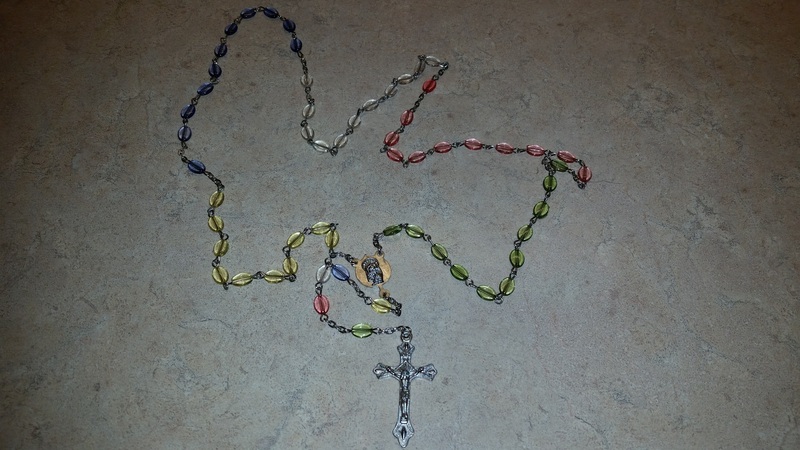 This Rosary is to honor the work of missions, our call to be missioners, and world unity and peace. 1. Green – for the forests and grasslands of Africa. 2. Red – calling to mind the fire of faith that brought missioners to the Americas. 3. White – symbolizing Europe, the home of the Holy Father. 4. Blue – for the ocean surrounding the Islands of the Pacific. 5. Yellow – symbolizing the morning light of the East and the “beginning of civilization” for Asia/Middle East. 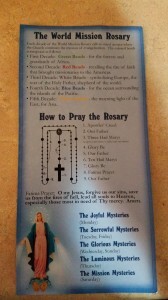 The World Mission Rosary is to be prayed just like you would any other Rosary, except with one caveat. 1. The visit of the Magi, the first missioner. 2. Jesus talks with the Samaritan woman, crossing borders/breaking down boundaries. 3. Jesus cures the centurion’s servant, acts of healing and service. 4. The conversion of St. Paul, expanding the faith of the Gentiles, the “other” and thus the world. 5. Jesus sends out His disciples, we’re all called to mission. 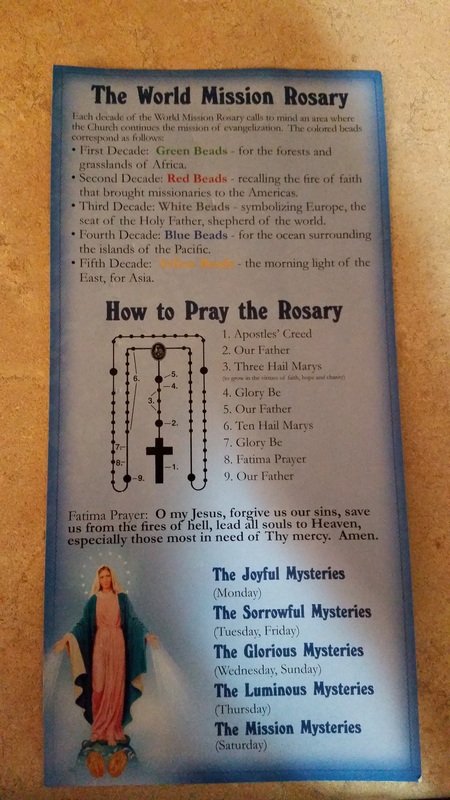 While Archbishop Sheen gave us the concept of the Mission Rosary, it appears that the Maryknoll’s gave these mysteries to us, not Archbishop Sheen. While the mysteries may seem harmless at first, I’d like to point out a few issues I see with them that weaken arguments for the Rosary, instead of strengthening them. The first problem I see is that Our Lady gave us the Joyful, Sorrowful, and Glorious mysteries. Our Lady appeared to St. Dominic and Blessed Alan and handed the Rosary, along with these mysteries, to them. Our Blessed Mother has reappeared throughout history in varying apparitions begging and pleading us to pray the Rosary. This Rosary she asks us to pray is not a man-made set of mysteries, but the same mysteries that she has given us. With the number of times she has appeared to men and women requesting we pray her Rosary, she has not at any time given any new mysteries. Our Blessed Mother is perfect, just as is her son, Jesus Christ. If she wanted us to meditate upon new mysteries, wouldn’t it make sense for her to give them to us herself like she did the Joyful, Sorrowful, and Glorious mysteries? The second problem I see is that these mysteries don’t look at Jesus through Mary’s eyes like the Joyful, Sorrowful, and Glorious mysteries do. One of the biggest arguments that Catholics use when discussing the Rosary to Protestants is that when we pray the Rosary, we are looking at Jesus through the eyes of Mary. When we look at the Joyful, Sorrowful, and Glorious mysteries, we can say that this is true, as Mary was present at each mystery. We can not say the same for all of the Mission Mysteries. When Jesus talks with the Samaritan woman, Mary was not there. When Jesus cured the centurion’s servant, it is debatable if Mary was present. We can say with certainty that Mary was not present at the conversion of St. Paul. It is also debatable if Mary was present when Jesus sends out his disciples. The only mystery where we know for certainty if Mary was there or not would be the Visit of the Magi. Furthermore, the conversion of St. Paul doesn’t even focus on Jesus, but on St. Paul. When we pray the Rosary, we are meditating upon the life of Christ, as seen through the eyes of Mary. This mystery takes the aim off of Jesus and places it on a Saint, which is not the intention of the Rosary. The third problem I see is it gives the impression that anybody can create whatever mysteries they want when that isn’t the case. As stated above and is part of Catholic teaching, Mary gave the Rosary to St. Dominic. It is not up to us, whether we are ordained, religious, or laity, to alter a devotion that is not ours to alter. The Rosary is not weakened if we dedicate each decade to one of these intentions and do not mediate upon new mysteries. Likewise, the Rosary is not strengthened if we are meditating upon these new mysteries while offering up our decades for particular intentions. Finally, to squelch an argument before it is raised, these mysteries do not form a more “complete life of Christ” as some proponents may argue like they do with the Luminous Mysteries. Our Blessed Mother is perfect. To state that the Mission Mysteries or even the Luminous Mysteries paint a more “complete life of Christ” goes against the belief that Mary is perfect, by suggesting that she gave us an incomplete Rosary. Mary is the Mediatrix of all Grace and has a will perfectly in line with that of God’s. This argument also suggests that God’s will is imperfect and needs correction later down the line, which simply can not be. The idea of offering up each decade for a particular intention is a noble and just gesture. The issue with this Rosary is not the intentions, but specifically, with the man-made “Mission Mysteries.” If you want to pray the Rosary and offer up each decade for the intentions of the Mission Rosary, that is fine and even just. If you pray the Rosary with man-made mysteries that aren’t given to us by Our Lady, then you are not strengthening your prayer, but weakening it. Pray the Rosary every day, but pray it as Our Blessed and Holy Mother gave it to us. If the Church can’t add mysteries of the Holy Rosary because our Blessed Mother gave us only the Joyful, Sorrowful, and Glorious, then how can any lay people wear the tiny brown scapular which was given only to the Carmelites (via St. Simon Stock) by Our Lady in the form of a large apron-like garment that forms part of their habit? Clearly the Church made the change, not Our Lady, and everyone accepts this change without question. I don’t know about the Mission mysteries, but even as a TLM Catholic, I believe Pope JP II’s Luminous mysteries to be fine. You know, it’s lent right now. According to the traditional liturgical schedule, you would be saying the sorrowful mysteries each day during lent. For other parts of the year, the Sunday mysteries change depending on the liturgical season. JPII eliminated this liturgical schedule when he introduced the optional luminous mysteries. I for one will never pray John Paul II’s luminous mysteries. I always felt that Our Lady gave us the Rosary with three mysteries to coincide with the 50 psalms. The Luminous mysteries I felt was a private devotion of Pope JPII. I believe Pope JPII added another station of the Cross but that has fallen by the wayside.